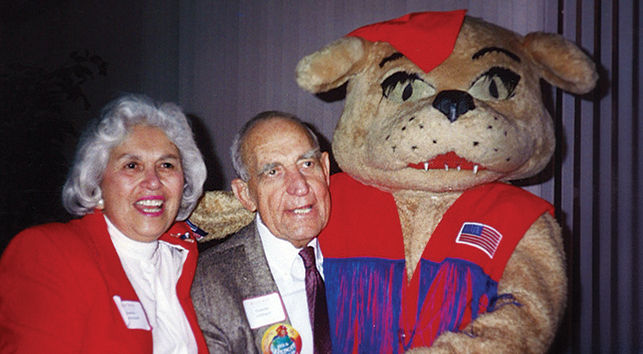 Stella and Marvin "Swede" Johnson were the ultimate team of Wildcat connectors. While he served as president of the UA Alumni Association from 1958-1963 she accompanied him around the country taking people back to Tucson through their taste buds with authentic Mexican cooking. The permanent nature of the endowment will guarantee that the Alumni Association will be here today and tomorrow engaging alumni through innovative programming, supporting students with scholarship and mentoring, and keeping pace with the needs of a modern University and its ever increasing alumni base. Students – The Student Alumni Ambassadors, the largest student group on campus with more than 600 members connects current students to alumni and strengthens the pipeline to the future. Faculty – The Heritage and Traditions course which teaches nearly 500 students a year about the history of the UA, the value of alumni, and the importance of philanthropy. Guest speakers include the UA president, provost, athletics director, alumni president, foundation president, and more. Alumni Communications – To compliment the beloved Arizona Alumni Magazine, the Alumni Association offers an award-winning iPad app that brings the magazine to life at the touch of your fingertips, a robust website, and vast array of digital tools for keeping alumni informed. Stella Pacheco Johnson, born July 16, 1928, passed away peacefully on March 25. Stella was a kind, generous, loving, inspirational woman who made a positive difference in this world. As part of a sixth-generation Tucson family, she attended the University of Arizona and lettered in tennis. She later became the executive secretary to the director of the University of Arizona bookstore. After giving birth to her first child, she became a life-long homemaker with numerous volunteer activities. She left Tucson in 1977 and returned in 1995 upon the death of her beloved husband, Swede. Fifty years ago, Stella and Swede dedicated themselves to a lifetime of cultivating and nurturing Wildcat connections.